Beauflor manufactures luxury resilient vinyl flooring that outperforms all vinyl flooring that you are use too. Every Beauflor vinyl collection is made with their exclusive engineered composite technology that allows their floors to be exceptionally tough and durable. 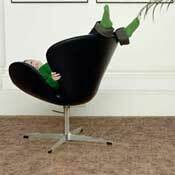 Your floor would compare favorably with high quality laminate and ceramic flooring. In addition to being exceptionally tough and durable, Beauflor vinyl combines their exclusive carpet backings to make your floor quiet and warm. Engineered Composite flooring is a new vinyl technology that features Ultra Grip to provide slip resistance which minimizes potential slips and falls. The Sirocco and Oceana vinyl collections offer extra wide withs, 16' 4”, to make your floor virtually seamless. No other vinyl flooring can offer exceptional comfort, quietness underfoot, exceptional durability, improved slip resistance, wholesale prices, and beauty all in one package like Beauflor. Beauflor vinyl has an engineered composite surface protection that is a specially developed blend of Ultragrip polymeric, ceramic, and mineral particles encapsulated in Multi Protect, a UV curable polyurethane. 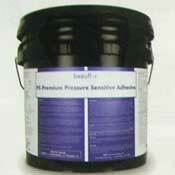 This combination provides an extremely durable, stain resisting surface with enhanced slip retardant properties. With Beauflor's engineered composite surface, your floor is tougher, safer, and easier to clean. Beafulor vinyl is an ideal choice for wet areas in your home such as entryways, baths, kitchens, laundry rooms, and family rooms. Beauflor is one of the only manufactures that offer a wide width vinyl of 13' 2" and the only manufacturer that offers a 16' 4" vinyl. With wide width vinyl, seams are virtually eliminated. Seam failure is a common problem in all floors, but with Beauflor, it is reduced dramatically. A simple installation system for either flue down or loose lay is available for a your-choice installation. 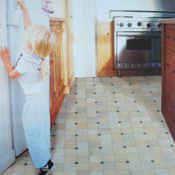 Beauflor vinyl flooring can be installed with adhesive. It is recommended that the use of Beauflor PS Premium Pressure Sensitive Adhesive, Beauflor Premium Seam Bond, and Beauflor LRF Primer/Sealer be used for installation. These products are specially designed for use in a Beauflor Installation with the full spread method. Beauflor vinyl flooring can be loose layed up to 24 sq.yds. There are no seams in loose lay installation and it can be layed over any exterior grade plywood or OSB. Beauflor's PS Premium Pressure Sensitive Adhesive is a high quality acrylic emulsion which combines the excellent performance of a pressure sensitive adhesive with environmental safety characteristics. Available in 4 gallon and 1 gallon buckets. 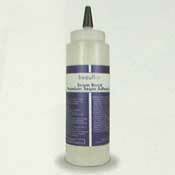 Beauflor Premium Seam Bond is a solvent-free seam adhesive for fully-adhered seam installations. Available in 1 pint and ½ pint cans. 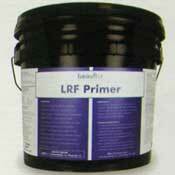 The Beauflor LRF primer is specially formulated as a primer/sealer for porous substrates prior to the application of Beauflor Premium Pressure Sensitive Adhesive. Beauflor LRF Primer/Sealer is a water-based solvent-free non-flammable primer/sealer that can also be used over old cutback residue which may have penetrated into the subfloor.